The 1785 Deed. What did I just read? The 1785 Deed, which I transcribed previously, between Mathias Baker (and his wife Mary) and George Myrise, was completed in October 1785. It was a lot of words to not say a whole lot, but it still adds to George’s 300 year old story I am trying to uncover. So what exactly does the Deed say in laymen’s terms? Let’s give it a go, and please let me know if I get something wrong! On October 22, 1785 a deal was struck between Mathias and Mary Baker and George Myrise for George to rent 2 lots of land in Peteresburg Town (which I believe is now known as Littlestown) within Germany Township in York County, Pennsylvania. The lots were 66 feet in length and 264 feet in depth. These lots were known on the General Plan by the numbers 75 and 76. They were located on the South side of Main Street and were bordered on the North side by Main Street, the East by lot number 77, the South by land owned by a Joseph Plautt (this is a guess to his surname), and on the West by a “16 foot Alley.” The original land was a tract under the province, then State, of Pennsylvania, originally patented to a Peter Little Senior at Philadelphia on September 18, 1760. George Myrise (his heirs, etc) agrees to pay Mathias Baker (his heirs, etc) a yearly fee of 7 Shillings 6 Pence on May 1st for the land. 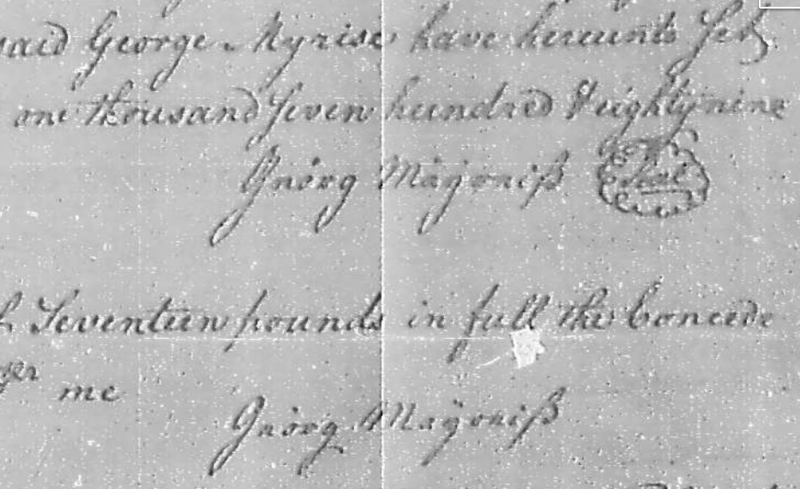 As this agreement commenced after May 1, 1785, George agreed to pay a fee of 5 Shillings for the land up to May 1, 1786, and the 7 Shilling 6 Pence after that, “forever.” If George (or his heirs, etc) has not paid by May 1st, he has 90 days to do so before Mathias Baker (or his Heirs, etc) may enter the property to attempt to obtain the money due to him. If after 10 more days go by without payment, Mathias Baker may sell off items in order to obtain the required sum, any excess money raised to be given back to George Myrise. Mathias Baker also has the right to repossess and re-enter the land for rent if no money is to be made or found, as if this deed had never happened. If George does pay the yearly sum, he has the right to live on the land and do what he wants with it as their own property, without threat of disturbance from Mathias Baker. The deed was signed by Mathias and his wife, but no signature from George Myrise is shown in the book copy. It was witnessed by R McIlhinny and Adam Wintroth. George is noted as paying the said 5 Shillings on that day as well, also witnessed by R McIlhinny and Adam Wintroth. The Deed was presented to a Judge or Justice of the Common Pleas Court of York County on October 25, 1785. Mary Baker is noted as being of full age and was aware of the deal being made and that she was fully in support of it and not coerced. Signed by a Thomas Fisher. This copy (in the deed books) was made and matched truly to the original on October 27, 1785 by Archibald McLean, a county Recorder. I find it interesting that there was concern that Mary was entering the agreement “freely and of her own accord.” Can anything be gleaned from that? Was this a normal situation in this type of agreement at the time with a wife being part of the agreement? Neither of the deeds I have found for George include mention of his wife. Or was this land possibly attached to Mary through a dower or inheritance? Looking at the Grantor and Grantee Indexes on the York County Archives website, we can see that there are plenty of deeds made by a Mathias Baker “ux” (and wife), and plenty of others that include a Mathias or a Mary/Maria Baker.